Sometimes the most delicious dinners are the simplest to create. By picking fresh ingredients, one can make a dish filled with wonderful flavors, with little effort. Some friends and I were trying to come up with a quick, healthy dinner. I’m always up for healthy, but don’t like to skimp on flavor. We came up with this super salad, which is packed with all kinds of vibrant, summer flavors. We made our salad dressing (just a simple whisk of olive oil and balsamic vinegar) but you can just as easily use your favorite bottled balsamic dressing. If time allows, marinate the chicken breasts in an olive oil based dressing for at least a half hour in the refrigerator. I usually use Paul Newman’s Olive Oil & Vinegar, or just olive oil and balsamic vinegar. If you need to throw it on the grill right away, just brush the chicken with the dressing or oil and season with salt and pepper. 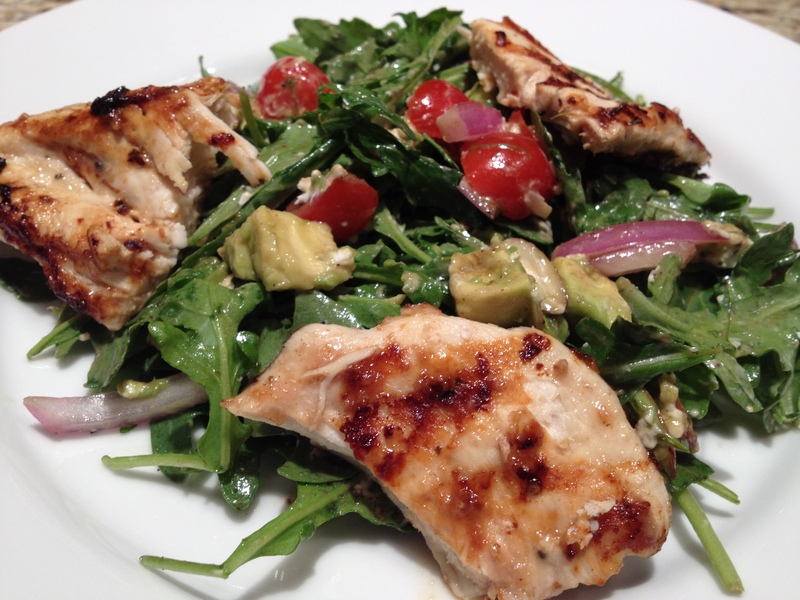 While the chicken is grilling, you can prep your salad. Empty the baby arugula into a large bowl. Cut the cherry tomatoes in half and add to the greens (you can use just red tomatoes, but using a mix of red and yellow is a very pretty presentation!). Slice the red onion & the avocado, also adding to the bowl. Chop the fresh dill and spread over the top of the salad – you can use as much to your liking – the flavor does go a long way though. Then add a handful of sliced almonds, which will add a nice crunch to the salad. In another bowl, if you’re not using a bottled dressing, pour in about 1/4 cup balsamic vinegar and slowly whisk in extra virgin olive oil until they begin to emulsify. Add salt and pepper as well. If desired, you could also whisk in a stone ground mustard. Once the chicken is grilled through, let the meat sit for about ten minutes before cutting into it. During this time, pour your dressing over the salad and add the goat cheese. Mix well and add salt & pepper. If you desire croutons, you can also mix them in at this time. Slice the chicken, against the grain. Have everyone serve themselves the salad, and then add the sliced chicken on top. Enjoy!